Construction of a new fish screening facility on the San Joaquin River. The work involved construction of a pile-supported 195 cubic feet per second pump station with a concrete constructed frame and top deck. The structure had fish screens mounted on the face on the river side with a brush cleaning system and sedimentation system as ancillary components to the project. The seven vertical turbine pumps were mounted on the top deck of the structure and extend 22 feet to the bottom of the river wet well. The pumps will supply flow through a total of five discharge lines to the PID Main Canal. The five new 30-inch diameter discharge pipes tie-in to a newly constructed canal headwall. 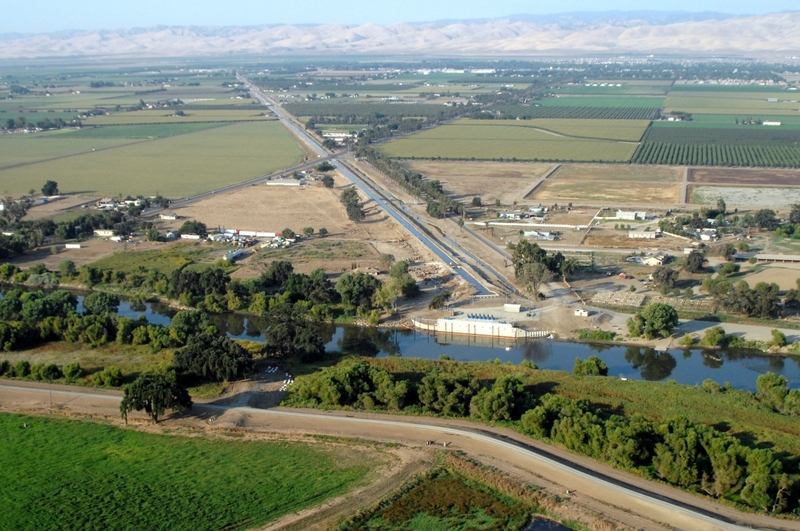 Construction included approximately 3,000 lineal feet of 24″ diameter HDPE discharge lines to supply irrigation water from the San Joaquin River to the PID Main Canal during construction of the new facility. Permit requirements and proximity to the river required a sheet pile cofferdam to be erected in order to dewater and remain outside the limits of the river during construction. A log boom was installed outside of the screens to keep craft from drifting too close to the facility. The work included reinforced concrete structures, structural piles, sheet piles and in-river cofferdam, excavation and backfill, dewatering, river water pumping systems, fish screens, sedimentation system, brush cleaning system and associated appurtenances, electrical power systems and instrumentation control systems.